It has been quite challenging to keep to our production schedule while we have been on tour. The hard part has been nominating a delivery address for physical print proofs and production samples. You know, an address where we knew we would be within 2 weeks and stay there over 2 days. There haven’t been many places like that. When the production samples got stuck in German customs for 5 days due to a not-so-accurate packing list, it really made our life difficult. A company can get up to 5 production samples without any custom fees. We got one package, but of 10 different products. So 10 samples, because the packing list had only one line ”board game sample”. Tiny, but costly error. Timo and I checked all the products in the heat of the German summer. 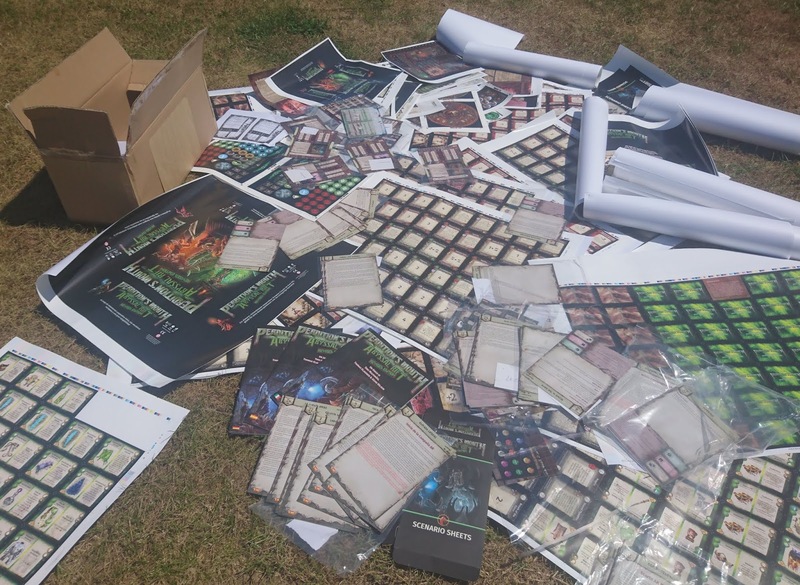 It took some hours to go through all the different language versions of PM:RE, to see if they had the correct sheets and cards, count all the miniatures, check the UPC codes... We also checked the packing and functionality of the new insert. We found errors. It is always frustrating at this time of the production, when you really want give the green light and get things rolling. When you are running out of time on the agreed schedule. Even if we know it’s better to find them at this point and not when the first customer sends you a request for missing parts. The quality is more important than the schedule. I believe all players are happier to get a decent game week or two later than originally assumed, than get a game on time but with flaws. Nevertheless, ironing out every small typo is virtually impossible. Something will be left in the final product and we know our fans will find those. Darwinning! is much smaller game. The whole European shipment was one pallet. Once we were convinced the game box has all the components it is supposed to have, we allowed the manufacturer to proceed. We gave instructions of how many game boxes and items should go into a carton. I made an Excel spreadsheet with all pre-orders of each item and started to count how many cartons of each item we need in Europe, USA and Australia. Then we made a sales estimation for each area. 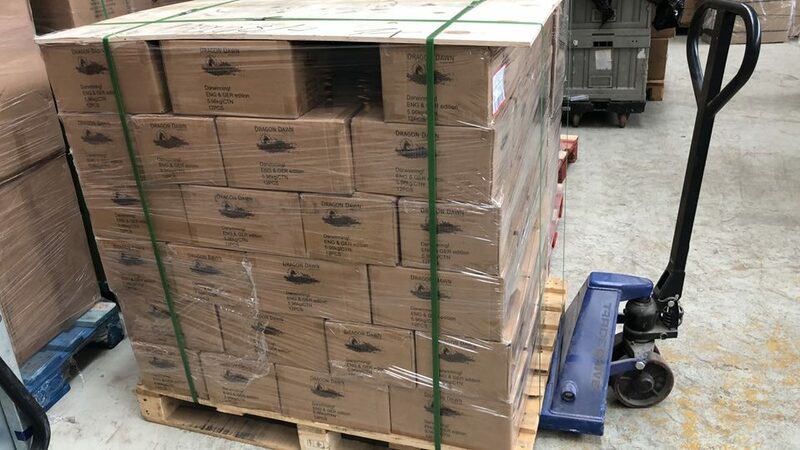 Based on these numbers we provided packing instructions to the Chinese manufacturer and asked how many pallets to each location this would be. There are different sizes for pallets. It took a while to establish an understanding with the Chinese of the correct – and cheapest – pallet size and height. Based on the numbers of pallets we got from China, Timo started to organise transportation. From China to Europe there are two alternatives: ocean freight or a train. The train is faster and not so much more expensive. We used it for PM:TG. We decided to transport a small part (just 4 tons!!) by train so we could have some games in Essen Spiel. We quickly learned that we need full containers for shipping the remaining part of our games. You know, those colossal metal boxes you see in harbours. After Timo had found a freight company with a reasonable price for 20ft containers, the Chinese gave us new numbers. Their first calculations were off by 10 cubic meters! We would need a 40ft container for the European shipment. The taller 40ft container. Hamburg harbour. Look at the amount of containers on that ship! When you think this shipping task couldn’t get any more demanding, the War begins. And now I mean the trade war between China and USA. Board games have been free of any tariffs. But as you know, the situation with duties can change as fast as Mr Trump can tweet. Due to the war, shipping prices from China to the US have risen radically: A container from China to USA costs double the cost of the same container to any European port, or more. Everybody wants to get their products to the US before any new tariffs are introduced. The latest news also suggests that toys from China will have a tariff. At the moment, nobody knows whether this will also affect board games. All we can do is ship our games and hope for the best. Typhoons, hurricanes, pirates and tariffs: stay away, Perdition’s Mouth is coming! Many PM reviews have been filmed. It is a really good game for filming as it has quite a lot of fantastic looking components. You can even find some playthroughs of the introductory scenario. Today, we can now offer you something even better than that. HitPointsGaming is a team of game enthusiasts, that record their play of various games. They already finished three (full!) Kingdom Death campaigns and many others. We are happy they agreed to film a play of Perdition’s Mouth: Abyssal Rift gameplay as well. And this time we do not speak about the well known 1a scenario, they started the campaign the hard way. The quality of their recording and cut is way better than the overall Youtube standard. Just see yourself, right here!